Consumers can avail upto 10 percent cashback while paying with HDFC credit and debit cards. Amazon is also offering no cost EMIs and exchange schemes as well. Amazon Prime members get an exclusive one day early access to the sale tomorrow. 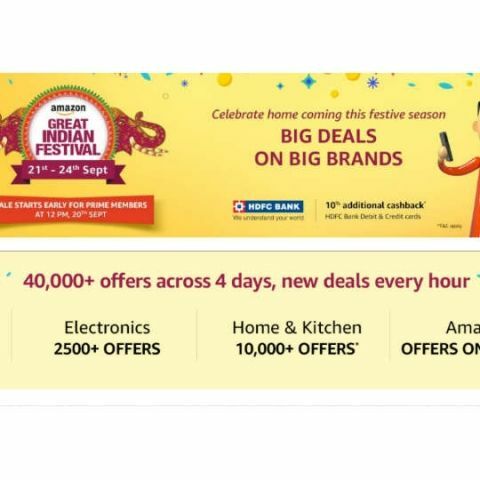 Amazon has announced its Great Indian Festival sale which will kick off tomorrow and last until September 24. The online shopping platform is offering some great deals on mobile phones, electronics and appliances. Amazon prime members will be able to avail exclusive benefits such as one day early access to the sale, flash sales on mobile phones and extra cashback offers. We show you what more Amazon has in store for consumers during its sale. Amazon will offer upto 40 percent off on various mobile phone brands along with 60 percent off on electronics and appliances. Users will observe price cuts of up to 40 percent on many smartphone brands such as LG, Huawei, Xiaomi, OnePlus, iPhone, Lenovo, LG, Samsung and more. As mentioned above, Amazon Prime members get an exclusive access to the sale at 12PM on September 20, one day before the actual sale takes place. Prime members will also get access to Prime exclusive deals as well. During the first day of sale, the Xiaomi Redmi 4 and Redmi 4A smartphones will be on flash sale at 2PM and 6PM respectively, exclusively for prime members. Along with the Xiaomi smartphones, Amazon is also offering upto Rs 10,000 off on the Nokia 6 smartphone. Prime members will be able to buy the Amazon Exclusive Mi Max 2 32GB at Rs 12,999 and the Fitbit Charge 2 Activity tracker at a 30 percent discount at Rs 10,499. Amazon is also offering up to Rs 5,000 on its Kindle e-readers and Rs 500 off on the Amazon FireTV stick along with an additional Rs 499 cashback for Prime members. Amazon will also offer some of its exclusive smartphones such as the Lenovo K8 note, OnePlus 3T, Samsung On5 pro, Samsung On7 Pro, Micromax Spark, Intex note, Neffos C5 and the Mi Max 2. Users can expect some heavy discounts and deals on the above mentioned Amazon Exclusives. Further, the ecommerce portal is offering upto 40 percent off on TVs, no cost EMIs and up to Rs 20,000 off in a TV exchange offer. Along with these offers, Amazon app users will have exclusive access to Amazon Golden Hours deals, which will take place everyday between 9PM to 12AM. The deals will offer products exclusive for the app users. Consumers shopping above Rs 500 during the sale on the Amazon mobile app will get offers such as flat Rs 1,250 off on hotels and Rs 1,000 off on flights on a roundtrip booking of Rs 5,000 from Yatra. In addition, Amazon will pick 10 consumers who will stand a chance to win 1 year of free travel worth Rs 1.5 lakhs. Amazon will also feature an “App jackpot” event which will offer prizes worth Rs 2 Lakhs.